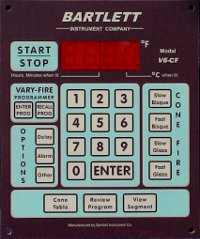 Bartlett Controllers have been designed for use on Kilns, Furnaces and Ovens both Electric and Gas. They can be programmed to control the whole firing, including ramp rate, hold times and final temperature, cone firing is also available. Bartlett make controllers for many other kiln manufactures who re badge them and sell as their own brand these include Orton, Duncan, Evenheat, Woodrow, Paragon, Rio Grande, Hotbox, Scutt & Olympic Kilns. 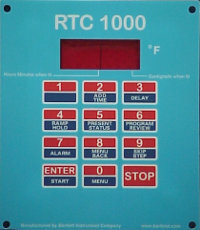 The RTC-1000 is a direct replacement for DTC-1000, DTC-800 & DTC-600 controllers with some additional improvements. These controllers are configured as either a 4 pin version for larger or hard wired kilns that have a 4 pin socket (we can supply wiring instructions if your kiln needs one fitted) or as plug through type for 10,15 or 20 Amp single phase kilns (3 pin Australian plug 25 Amp optional). You can use the Plug Through type by just pluging the unit into a wall outlet and your appliance you wish to control into the 3 pin socket on the unit (please state 10, 15, 20, 25A or 4 Pin type when you order). If your kiln has a Kiln Sitter fitted we can supply details on how to disable it so you don't have to have your kiln modified by an electrician. The Genesis is a versatile touch screen controller that regulates the temperature in your kiln so you can fire a variety of products like ceramics, glass, jewellery and more. The Genesis has all the features of its earlier models, the V6-CF and RTC-1000, along with Wi-Fi capabilities for software updating, built in diagnostics, and maintenance logging among other new features. Optional multi zone temperature system is available, this can control up to 3 separate zones using 3 thermocouples and can control up to 4 separate elements. Note: All controllers do not come with a thermocouple if you require one please choose one from thermocouples page. 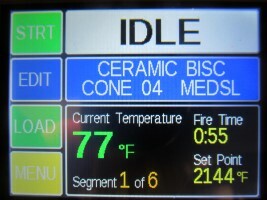 * 2 or 3 Zone controllers require extra relays installed into existing kiln control panel, type and number is dependant on kiln type and zone requirements.